The most impressive move at Sunday’s IndyCar Series race in the streets of Long Beach was made by Graham Rahal. It was a move that was made after he exited his car, removed his helmet and gloves and had a microphone shoved into his face. He had just had a podium finish taken away by INDYCAR offiicals but instead of going spring-break berserk, Rahal kept his head as he stood next to his cooling Rahal Letterman Lanigan Honda. The incident that led to the “pill” question occurred on the final lap of of the grand old Grand Prix of Long Beach. Rahal was running third and headed to his first podium finish of the season. Behind him – right behind him – was Chip Ganassi Racing’s Scott Dixon. Dixon was on better rubber and had push-to-pass power remaining. As they came out of a final turn, Rahal made a quick – but very apparently legal – move to the starboard side. Dixon backed off and Rahal crossed the finish line in third place. A couple minutes later, both drivers were approached by race officials. They were informed that IndyCar stewards had decided the move was illegal and Dixon was gifted third place and Rahal bumped back to fourth. Rahal was approached by reporters and calmly stated his case. Series officials have long struggled with the issue of blocking – a term that is highly subjective and Rahal noted all of that. Dixon, unsurprisingly, gave the stewards an attaboy. “You know the rule is you can’t come back to defend if somebody’s already there, and that’s what happened,” Dixon said. After the race, Rahal and his team owner/father Bobby Rahal met with officials to plead their case. Bobby argued that the series rules are vague on blocking and need to be addressed. The stewards – former drivers Arie Luyendyk and Max Papis – wouldn’t budge. Also not budging was team Rahal. “But like I said, after watching it (on video), I stand behind the move even more than I did before,” Graham Rahal said after the meeting. But with that, Rahal was off to find a television and a pizza. His beloved Columbus Blue Jackets were set to play Game 3 of their NHL playoffs series against the heavily favored Tampa Bay Lightening – a game Rahal’s team would win and in doing so move to a 3-0 lead in the best-of-seven series. INDYCAR was left to ponder a controversial and important call that has, in effect, set a precedent on what a legal block is and what is not. 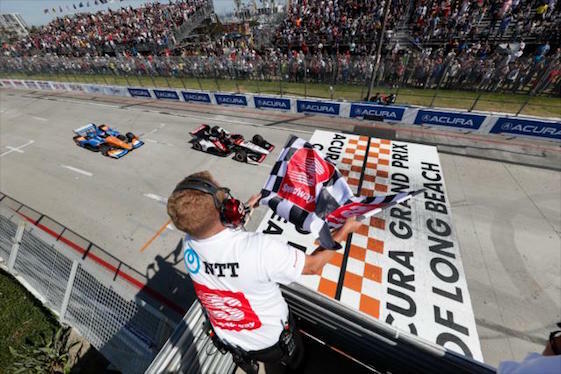 Here’s hoping INDYCAR officials headed into conference to talk about whether or not calls like the one they made at Long Beach are going to discourage the type of hard racing that many fans want to see.